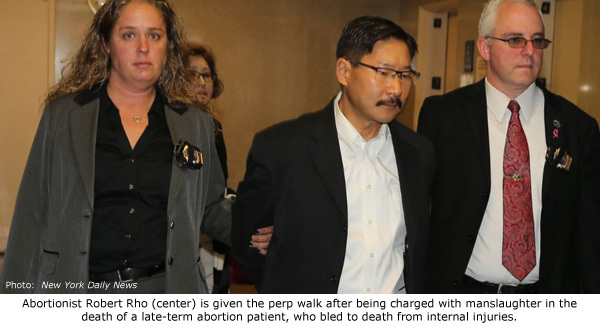 Queens, NY – A New York abortionist, Robert Rho, 52, has been indicted on one count of second degree manslaughter in the death of one of his patients, 30-year old Jamie Lee Morales of Buffalo, who died on July 9, 2016, after a severely botched second trimester abortion. Rho was charged on Tuesday during a court appearance in Queens, and was released on a $400,000 bail bond. He has promised not to engage in the practice of medicine. Rho’s attorney told news media, which have already given this case national attention, that Rho closed his abortion facility voluntarily after Morales’ death. 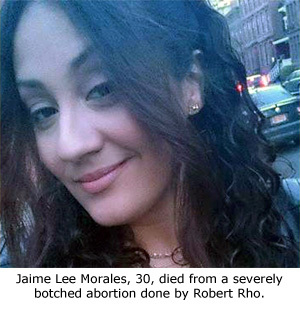 Morales went to Rho’s Liberty Women’s Health Care in Flushing on July 9 for an elective second trimester abortion. According to news reports, Rho thought the abortion went without complication until staff noticed she was bleeding heavily in the recovery room. Rho determined that she required a second procedure, but that did nothing to control the bleeding. Despite being woozy and having collapsed once at the clinic, Rho released Morales to her sister, who put Morales in her car and began the trip to the sister’s home in the Bronx. Along the way Morales fell off the back seat and became non-responsive as the result of heavy hemorrhaging. An autopsy was performed where it was learned that Rho had lacerated her cervix, punctured her uterus and sliced her uterine artery. Any one of those injuries would cause heavy bleeding, but together, they proved catastrophic. Prosecutors charged Rho, saying he had been “reckless” in failing to provide adequate medical attention in a timely manner. Operation Rescue was aware of Rho and his Liberty Women’s Health Care abortion facility, which were listed at AbortionDocs.org, but little was known about them. Rho had been conducting abortions along with female genital reconstruction surgery for 23 years. There is no record of any previous disciplinary action on his New York medical license profile that may have attracted attention. Morales is the second woman this year known to have died after an abortion. On July 3, Cree Erwin died in her mother’s bed after receiving an early abortion by Laura Castleman at Planned Parenthood in Kalamazoo, Michigan. An autopsy is still pending in that case.